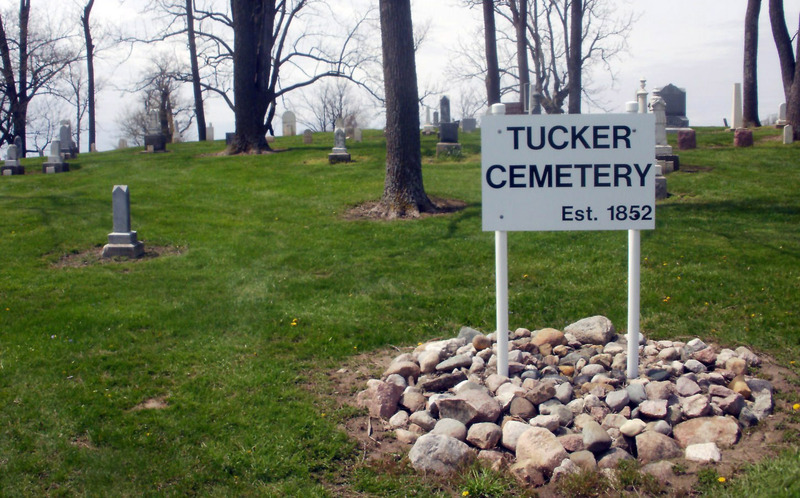 Tucker Cemetery, just south and west of US 31 and SR 28, takes it's name from the one time owner of the land surrounding it, Hugh Tucker. The cemetery itself sits on land first owned by John Williams, then William Sickle, followed by John McCorkle. In 1855 John and Susan McCorkle deeded the cemetery to the Tipton Presbyterian Church. Today the Jefferson Township Trustee is responsible for the cemetery. Some individuals a century or more ago referred to it as Center Grove Cemetery because it was situated a half mile north of the Center Grove Presbyterian Church which existed at the time. Darlington D. Aldridge -- There are two stones side by side with this name and similar dates. One stone may be a replacement for the other with corrected dates; or there are two individuals with the same name who died two days apart. Although I can not find proof of a Darlington Jr., I believe the second stone is that of a son or nephew simply because two footstones exist instead of one. Joseph VanBuskirk, Sr. -- Joseph did die in Tipton County. Lot pins found by the D.A.R. were mistakenly read JVanB. It is more likely he is buried in Sumner Cemetery where his son Joseph Jr. is buried. Rows are numbered from east to west, stones north to south. During the cunstruction of the new SR 28/US 31 interchange, four headstones were recovered from fill that had been used for an old field access road now within the current US 31 right-of-way. An archaeologist from INDOT's Cultural Resources Office, after research, found the four people associated with the markers were removed from Tucker and re-buried at Fairview Cemetery and the old stones discarded sometime between 1900 and 1950. The four people moved were: Milton J. Ferguson, George McColley, Emma Graham and Joan Katon.